Wow, I can’t believe it’s Wednesday again! And the month of January is almost gone, too! Where is time going??? It’ll be spring before we know it. As always, I’m participating in The Wednesday Hodgepodge, and, as always, I’m grateful to our hostess, Joyce, for another great set of questions. She does such a great job of hosting. 1. “The cure for anything is salt water-tears, sweat, or the sea.” (Isak Dinesan) Would you agree? Of the three, which has ‘cured’ you most recently? I agree. There’s absolutely nothing like a day beside the sea to make me feel better. It’s been a while since I’ve spent time beside the ocean (over four months), but that’s the last time I felt ‘cured’. 2. What’s something you can’t eat without salt? Do you normally salt your food a lot, a little, or not at all? I can’t eat cooked vegetables without salting them, they’re nasty without it. I consider myself a fairly light salt eater. 3. Sands of time, bury your head in the sand, built on sand, or draw a line in the sand…which sandy phrase could best be applied to something in your life right now? “Sands of time” best applies to me because time is passing so quickly during this phase of my life. I’m constantly aware that, one of these days, before I realize it, my hourglass will become empty. I love the song “Knee Deep” by Zac Brown Band. Several years ago, I made a video montage to the song, using family beach photos. I’ve shared it on my blog before, but I think today’s a good time to share it again. Yesterday ran me. I had an appointment with the optometrist to have a retinal scan done. I received some good news and some bad news. The good news is my retinas are fine. The bad news is he’s going to have to remove the ‘lump’ on my eyelid. The doctor says that’s what’s impairing my vision. The good news is the doctor is going to let me have the procedure done at the eye surgery center, under anesthesia. (I’m glad since he will have to turn my eyelid inside out to do this). The bad news is the procedure will cost a lot more than if he’d done it in his office, without anesthesia. It looks like I’ll be meeting my insurance deductible early, this year. My surgery date is set for February 9. 6. You’re on an island holiday. Will I most likely find you parked in a beach chair, shopping in town, on the back of a jet ski, or snorkeling off the back of a catamaran? You’d find me parked in a beach chair [under some kind of shade]. However, I would take a short break for a little shopping, too. Good health! Having spent a fair amount of time in doctor’s offices, lately, it’s been very enlightening to see and listen to other people’s situations. Anywhere, on any given day. there are people dealing with serious health issues. If you are healthy, or if your health issues are not life-threatening, you are truly blessed!!! Ed and I live in a part of the country where storms wreaked havoc all last weekend. The weather here was very unstable, and we were under constant tornado watches all weekend. Thankfully, no tornadoes touched down in our immediate area, but others, nearby, received a lot of damage. What we did receive was rain–and lots of it! I’m not sure of the ‘official’ amount of rainfall, but it was A LOT. It’s very wet here, but we feel very blessed to have escaped any damage. Praise the Lord! You know, just when things settle down, and you think it’ll be smooth sailing ahead, something happens and those storm clouds of life start brewing again. It’s a never ending cycle. Last Tuesday I met with an ophthalmologist to be evaluated for cataract surgery on my left eye. The sight in that eye has been declining for several months, and when I went for my annual eye exam, in November, the optometrist told me she thought I might be a candidate for cataract surgery. The first available appointment with the ophthalmologist was on January 10, so I patiently waited for that day to arrive. On January 10, I had several tests performed, then sat in a room to wait while my eyes dilated. The doctor finally came in, asked me a few questions, then sat down on a stool in front of me to examine my eyes. He looked me, straight in the eyes and asked, “How long have you had that sty on your left eye?” I was surprised, and answered, “I didn’t realize I have a sty on my left eye.” I told him I’d had a sty [on my left eye] a few months back, but had treated it, and it went away. At least I thought it had. The doctor proceeded to tell me the cataract is not the problem with the vision in my left eye, because the size of the cataracts is the same in both eyes (and I can see out of my right eye). However, he didn’t tell me what my problem is! Instead, he prescribed some drops for my affected eye, and asked me to come to his office in two weeks to have a retinal scan done, to see what’s going on. So I’m using the drops and trying to patiently wait…again. After I left the doctor’s office, I touched my eyelid, and discovered, for the first time, the lump in the middle of my eye lid. I can’t believe I hadn’t noticed it before, but, then, I never touch my eyelids except with a washcloth or a make up sponge. But then, the optometrist apparently over-looked it, too, so I don’t feel so bad. In other “unexpected” news, on Thursday morning, I bent down to get a bowl of chicken feed out of the sack, just like I’ve been doing for the past few weeks, when, suddenly, I felt a sharp pain in my lower back. I knew, immediately, I’d hurt my back again. Sigh. I try to be mindful of what I do, but sometimes things just happen–usually when I least expect it. I hope my back will settle down on its own, like last time, but, for now, my old friend “sciatica” is back. Today also happens to be the day Ed and I meet with the doctor to discuss the “results” from the test he had performed two weeks ago. We’re hoping for the best, but bracing ourselves for the worst. Life is never dull, especially at this stage of it. So there you have it. Our lives, at the present time, in a nutshell. Of course, I’m reminded, things could always be worse. As we arrived at church, yesterday morning, I witnessed an older lady painfully struggling to make her way up the steps. It turns out, she, too, has a ‘bad back’ and is suffering from sciatica, but in a much worse form than mine. I silently thanked God for the gentle reminder, and praised Him that things are as well [with us] as they are. I’ve never lived near or been to a desert, and I really don’t have any desire to do so. I like trees! If I had to visit one of the desert towns listed, I’d choose to visit the corner of Winslow AZ so I could see the new, life-sized bronze statue of Glen Frey, formerly of The Eagles. 2. What’s a plan or project you’ve deserted in the past year? I’ve deserted my photo collection. My collection sits abandoned on my computer, and in many bright orange ‘Shutterfly’ envelopes. I used to make scrapbooks, then I began making video montages, using family photographs. It’s been well over a year since I did either one of those projects with my photos. Two words I have trouble spelling are license and diarrhea. In fact, I misspelled both words as I typed them in this sentence. 4. High and dry, like watching paint dry, dry run, dry as dust, not a dry eye in the house…which phrase can you relate to currently? Explain. I can most relate to “not a dry eye in the house”. One of my cousins passed away, unexpectedly, last Thursday. My brother, who lives in Florida, was asked to preach her funeral, so he and his wife spent the weekend with us. As you can imagine, it was an emotion filled weekend, but Ed and I had a great visit with my brother and his wife, in spite of the circumstances. It’s been years since I’ve needed to have anything dry cleaned. I try to stick with wash-n-wear. Starch, please! It makes the clothes look better. 6. What’s a food or beverage you enjoy that’s named for a place? I enjoy eating “Low Country Boil”, a meal consisting of shrimp, smoked sausage, corn, potatoes, and onions boiled together in a large pot, along with seafood seasoning. ” Low Country” refers to a certain geographical and cultural region along South Carolina’s coast. Yes, I do need (and enjoy) a certain amount of solitude each day, especially if I’m blogging or reading. I find it difficult to concentrate if there’s noise or other people around. Yesterday’s office surgery is now “behind” me. No pun intended 🙂 The surgery wasn’t bad, other than the indignation of where it had to be performed. The surgeon was very nice, and talked to me during the procedure. The cyst was rather large, so the incision has been a bit painful, especially when I sit. Last night, it hurt, no matter what I did. Thankfully, I know this is a temporary thing! Thanks to those who prayed and encouraged me, last week. I’ve been waffling over whether or not to make a doctor’s appointment concerning my back issues. My back seems to be s-l-o-w-l-y improving, so I’m going to give it another week, or so, before I make any decisions. 2. It’s the middle of August, but I’m already seeing lots of autumn-related posts. Do you think we rush the seasons? If so, does that bother you? Yes, I do think the seasons are rushed. When Hobby Lobby puts out Christmas decorations in the middle of summer, I say that’s rushing things a bit! And, yes, it does bother me when people rush the seasons. Why can’t we fully enjoy one season before rushing into the next? 3. Your favorite summertime ‘art’ found in nature? 4. Stephen R. Covey is quoted as saying ‘We judge ourselves by our intentions, and others by their actions.’ Agree or no? Do you define yourself based on your intentions, your actions, or something else? That’s a difficult question, and I don’t have an answer, today. I’m not sure how I define myself, but what’s the old saying? “The road to hell is paved with good intentions”, so I don’t put a lot of stock in those. I’m a bit slow to react in a kind of crisis of any kind, in fact I usually ‘freeze’ for a moment or two, which can be disastrous during a crisis. My husband, Ed, on the other hand, is quick to react, and always great in a crisis. This probably comes from years of working as an x-ray tech and an EMT, as well. Ed’s helped save lives, by doing CPR on several people, including my father. In addition, he once prevented our youngest son from drowning, and acted quickly enough to keep our house from burning down after some pool chemicals ignited under our carport. 6. What’s been your go-to dish this summer? Is it something you’ll continue making as the seasons change? The first thing that comes to my mind are the delicious grilled chicken finger salads we’ve enjoyed throughout the summer. Yes, I’ll continue making them, at least for a while, but they won’t be nearly as good without our garden-fresh carrots, tomatoes, and cucumbers. No, I haven’t jumped on the coloring bandwagon, but I’ve been thinking about it. I’m not sure if I’d enjoy it or not, but I might give it a try. I enjoy coloring, I’m just not very good at it. After being ‘shut in’ for over a week, I was finally able to do a little shopping, yesterday. My back only ‘acted up’ when I’d first get out of the car, after I’d been sitting for a while. Within a few minutes I could stand up straight and walk normally. Walking wasn’t painful, like before, and Ed did all of the bending for me. Folks, don’t ever take your back for granted. Just to be able to sit, stand, walk, or bend painlessly is such a blessing! I see large brown patches of dying grass. We could really use some more rain and cooler temperatures! In the meantime, at least Ed’s not having to mow the grass nearly as often. It looks like today is shaping up to be another hot, sunny day. We’ve had a lot of those, this summer! how much I’d like to be able to do all of my own housework! It’s horrible having to depend on someone else to do the things I’m not able to do, right now. Ed’s great, and never complains, but I feel somewhat useless. I do what I can, that doesn’t involve vacuuming, sweeping, bending, or lifting anything heavy. for the thoughtful people in my life. Our sons and their families came over for a visit, on Saturday evening, and they brought supper with them. After having been a shut in all week, the food and fellowship was much appreciated! My favorite moment of the evening was seeing little Evan dragging his own high chair into the kitchen. He was letting us know he was ready to eat! is sitting on the little deck outside of my bedroom door, watching the birds at the bird feeder, while rocking in my new chair. It’s very relaxing out there, and the view of the woods gives me the illusion of being somewhere in the mountains. my nightgown. I haven’t bothered getting dressed, yet. One of the advantages of living in the country–I can wander around the yard in my nightgown, which I chose to do today. something new out of something old. Ed and I are taking turns painting another garden statue. This statue is a girl who matches the boy we recently finished. almost finished reading The Hiding Place by Corrie Ten Boom. I’ve enjoyed the book, but, at times, it made me sad. Especially after Corrie and her family were imprisoned for hiding Jews. The Best of the Statler Brothers TV Shows on dvd (an early birthday gift to myself). I’m still amazed at the talent of these four men! They wrote all of the material for their shows, as well as most of the songs they sing. We are still making our way through the audio version of the Bible that our oldest son gave us. We’re almost finished with II Chronicles. and praying these back issues will resolve themselves on their own. If not, it’s back to the neurosurgeon for God knows what. It’s only been 11 months since my previous back surgery. I’m not ready to go back. to have more patience. If there’s one thing I’m learning about this season of life I’m in, it’s that you must have plenty of patience. Ed and I made two batches of grape jelly, last week. It’s the first time we’ve ever had enough grapes [on our vines] to make jelly with. It was a joint effort, and it turned out well. Here’s our oldest grandson, Caden, on his first day of 2nd grade home school, last week. Granddaughter, Madison, will start home school today, I think. grass and weeds have been running rampant. Nobody’s been out there with a hoe in quite a while, since Ed’s been helping me with housework and rewiring the chicken coop. (Actually, I think Ed may be out there, now, as I write) Oh, there are also a few peas growing out there, too, along with the last of my zinnias and some sweet potatoes! We have some lettuce and cabbage seedlings planted in cups, to be transplanted, later, but that’s it. There’s not much going on here, these days. I’ve spent the past few days moving from the couch to the chair to the bed, trying to get comfortable. I’m beginning to feel a little better, and even walked a short distance [outside] yesterday evening and this morning. The soreness in my back is better, but I’m still walking weird, especially after sitting for a while. I’m also concerned about the numbness in my left leg, a sign of nerve involvement. We have no real plans for the week. As soon as I’m feeling up to it, we need to make a shopping trip to pick up a few pet supplies. Our cats, chickens, and fish will not be happy with us if they run out of food. However, there will be a joint family birthday celebration [for Jennifer and me], at the end of the week. I sure hope I feel a little more like celebrating by then! Thanks to Peggy Hostetler for hosting The Simple Woman’s Daybook! So, I’ve been absent from blog land–again. I guess it’s okay, because I notice a few of my blog friends have been absent, too… Sometimes life is busy, but, sometimes, that’s a good thing. Life goes on. I don’t remember what we did all day, on Friday, but I do know I was tired from the shopping trip, on the day before. I did the most walking I’ve been able to do in two months! It was good to be able to walk without having to sit down and wait for a spasm to pass. On Friday night we kept one of our grandsons for a while, so his parents could go out and eat. Our granddaughter came over to help “babysit”, then Brad, Jennifer and Evan came over for supper, too. By the end of the evening our living room was filled with family, as everybody trickled in. Friday was the end of Brad and Jennifer’s first week of their new jobs, and the first time they’ve been able to be here on Friday night, in quite some time. (Their home base is at Jennifer’s dad’s, for the moment.) I cooked baked spaghetti and they ate supper with us. Jennifer’s face told me she’d had a difficult first week at work. She’s now working as the nurse for an orthopedist, and says he sees about 50 patients per day! I hope the second week of work goes smoother for her. On Friday, I finally heard from the neurologist’s office that I’ve been referred to, concerning the bad discs in my back. Would you believe the first available appointment isn’t until July 21? That’s five whole weeks away! All I could say was “Wow”, but I took the appointment. I finished taking my round of Prednisone, on Saturday. The sciatica is better, but not gone. I just hope it doesn’t flare back up before my appointment. I have daily pain, but nothing I can’t handle, so far. The numbness/tingling, in my left leg, is better, but not gone. While walking has become easier, sitting has become increasingly difficult. I’m constantly rotating among three different chairs, in our living room, in an effort to get comfortable. On Saturday, a heat wave came to town, and it’s still here! Our air conditioners are working overtime just to make life bearable here in the deep south. The thermometer underneath the cover over my swing read 105, on Sunday! It was HOT outside! This heat wave is supposed to last this entire week. Fortunately, we got some rain, last week, otherwise our grass and garden plants would be history. In addition to picking, shelling, and ‘canning’ butter beans, Ed and I shelled a few peas, too. Jennifer’s dad had some peas to give away, so Brad brought us some. (Thanks, Brad!) Ed and I spent almost 5 hours shelling peas, on Sunday afternoon. We watched an episode of CSI, Los Angeles, an episode of The Alaskan Bush People, the entire movie Rocky, and the first half of Rocky II while shelling. It was a good day to be stuck inside since it was 105 on the swing! The sun is barely up, and Ed’s already in the garden, this morning. I SO wish I could be out there with him! Instead, I’ll do the feeding chores, clean out the chicken coops, cook breakfast, and blanch yesterday’s peas. I suppose I’d better get my thumbs ready to go, too, because Ed’s picking butter beans again… Life goes on in Gooseneck. Ed and I spent a quiet weekend at home, with each one of our off-spring popping in and out at various times. No big get togethers or family dinners, just one family or other stopping by for a visit. Brad, Jennifer, and Evan surprised us by bringing lunch, on Sunday, which I greatly appreciated. Speaking of Brad and Jennifer, both started their new jobs today. My thoughts and prayers are with them both, especially Jennifer, who will be working a 12 hour shift on her first day. Evan will be spending his first day with his step-grandmother, so I’m hoping and praying they have a good first day together. For now, Jennifer and Evan will be staying at her dad’s house, while Brad continues to stay at their house, in the city, until it closes. (There are still some loose ends to tie up there.) Jennifer’s new job is closer to here, while Brad’s is still in the city. Our daughter and her husband spent a productive weekend together, working on their marriage issues. I’m hoping and praying they can eventually get things resolved, and will come out of this with a stronger marriage than before. (Next month will be their 14th wedding anniversary.) I told my daughter the other day, “If it doesn’t kill you, it will make you stronger.” When a marriage gets into trouble, it has a ‘ripple effect’ and everyone feels the pain. Our family is no exception. My primary care physician called me on Friday, to discuss my MRI results. He feels the need to refer me to a specialist, concerning my back. I’ve chosen to go back to the neurologist who did my cervical fusion, ten years ago. The doctor’s office should be working on the referral, this week, but I don’t expect to hear back from them for several days. In the meantime, I’m taking prednisone, which has helped a great deal with the numbness and spasms in my left leg. While walking has become somewhat easier, sitting has become a bit more of a challenge. Before I leave the subject of my back ailment, I have to share this bit of knowledge. Three years ago, this summer, I was hit by the mother of all yeast infections. I made numerous trips to doctors in an effort to eradicate this condition, without any success. Eventually, by Christmas of that year, I was forced to go on a sugar-free diet. This helped my condition, but didn’t cure it. Finally, after searching the internet for cures, I started a three-step ThreeLac (probiotics) program, along with an herbal supplement called Candida Clear. Now, three years later, I’m still only 85% rid of the yeast. Because of this “condition”, for the sake of comfort, I’ve been forced to sit on my lower spine, instead of on my actual behind, most of the time. I’d be willing to bet money, that’s what’s happened to my back! I’m thinking that sitting incorrectly has affected my back. It’s funny how one thing can lead to another, huh? Speaking of sitting incorrectly and bulging discs, my back is telling me it’s time to get up and take a break from sitting. Have a great Monday. I’ll try to make it around to visit your blogs, a few at a time, throughout the day. 1. What’s something you’re looking forward to in the month of June? I’m looking forward to celebrating another wedding anniversary with my husband of forty-three years. Hopefully, Ed and I will get to spend the day under our favorite oak tree, on St. Simon’s Island, then stop by KFC for our traditional anniversary meal on the way home. When Ed and I first got married, way back in 1972, it was just the two of us for the first six years of our marriage. Now we’ve raised a daughter and two sons, and it’s just the two of us again. I guess you could say I’ve come full circle in that respect–it’s just me and my hubby again. 3. Lonely Planet lists 10 spots in America you should see in 2015 and the reasons why. How many on the list have you seen? Which one on the list would you most like to see? Unfortunately, I haven’t seen any of these places. I’m not sure which I’d most like to see, but I’d probably be most likely to see Greenville, SC because it’s closest to where I live. The old church hymn I Know Who Holds Tomorrow is running through my head at the moment. If you read yesterday’s post, then you know that many things in my life are unsettled at the moment. I don’t know how everything is going to turn out, but I do know who holds tomorrow, so I know it’ll be okay. 5. Strawberry ice cream, strawberry short cake, strawberry pie, or strawberries right off the vine…your favorite? 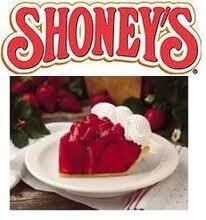 I love strawberry pie, especially Shoney’s strawberry pie. I haven’t eaten at a Shoney’s in years, so I don’t even know if they still serve strawberry pie, but it used to be delicious. 6. Aesop‘s birthday is celebrated on June 4th, although there is some disagreement as to whether or not that’s accurate, or if he was even a real person. Regardless, the name Aesop is associated to this day with many well known fables. Which of the following best applies to something in your life right now? The Tortoise and the Hare(Slow and Steady wins the race), The Ant and the Grasshopper (Be prepared), The Fox and the Goat (Look before you leap) or The Crow and the Pitcher (Necessity is the mother of invention)? I’m going to say The Tortoise and the Hare best applies to my life, at this particular time. Ed and I’ve had so many life challenges since his retirement, surely, if we keep forging ahead, we’ll win this race! 7. The answer is yes…what’s the question? Do I wish I had better health insurance coverage? YES! I had an MRI of my spine done yesterday. Since my insurance does not cover such tests, we had to pay for it out-of-pocket. The MRI was not a pleasant experience because I’m a bit claustrophobic, and that round tube was awfully small. Nineteen minutes passes very slowly when you have to lie perfectly still inside of a small, very noisy tube, but I survived. The report isn’t ‘official’ yet, but my MRI showed not one, but two, bulging discs in my lower spine. There seems to be no rest for the weary! Back saga to be continued… Eight weeks and counting. 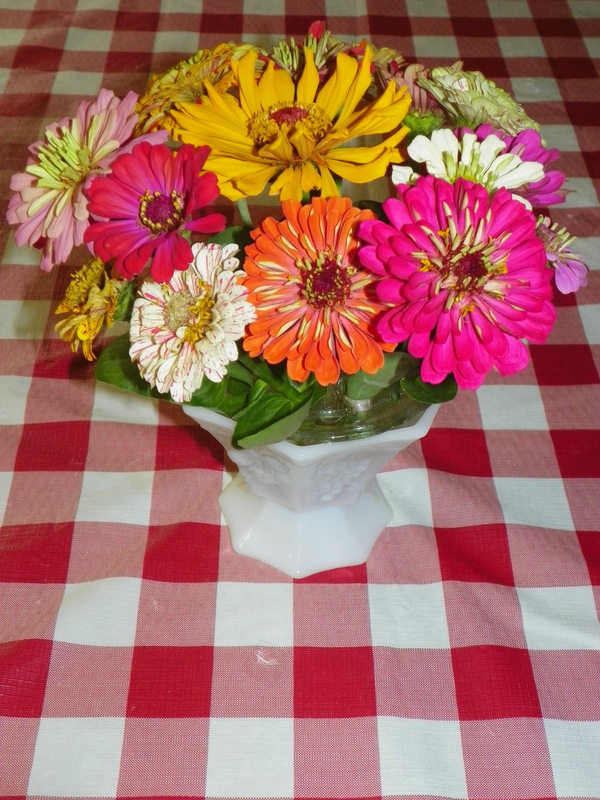 On a happier note, yesterday, I picked my first bouquet of zinnias out of the garden. (You may recall that I always plant a row of zinnias, each year, in honor of my grandmother, who was my role model.) Ironically, these flowers were the last thing I planted before my back went out. I’ll have to make sure I really enjoy them, this year, won’t I? It’s been a while since I’ve been here in blog land. I’m sure this blog space is feeling quite lonely and neglected, as well as my blog friends. Once again, I’m going to try to give both the attention they deserve. Unfortunately, my blog and blog friends will have to share my attention with about a million other things, at the moment. If you are a blog friend who’s stopped by, forgive me for not visiting you on a more regular basis. Since January 16, my life has basically been in turmoil. Ed got laid off from his job, which brought about many changes. We’ve tried to meet each challenge with grace and determination, and adjust to the changes brought about by Ed’s unscheduled retirement, but the challenges have been almost non-stop! The month of April was filled with all sorts of challenges for Ed and me. At the beginning of the month, we discovered termites and mold under our house, and my back “went out” after several days of helping Ed plant our garden. I was in a lot of pain, with sciatica, and unable to do much of anything for the entire month of April. By the end of the month, our garden nearly drowned and we had spent several thousand dollars getting our house treated for termites and moisture, but the moisture problem still persisted. We’ve experienced all sorts of glitches with getting our insurance changed over and getting Ed’s social security started. Thankfully, the hospital offered Ed an eight week severance package, and he had almost eight weeks of vacation built up. Those funds held us over for nearly four months, and helped pay for some of the home repairs we’ve experienced. Now the checks from the hospital have stopped coming, and we’re waiting for Ed’s first social security check to arrive. We didn’t take into account the fact that social security lags a month behind. Ed’s benefits began in May, but he won’t receive a check until the third week of June. Sigh. Thank goodness for the small unemployment benefits he’s been able to get. By the beginning of May, my sciatica was better, but my left leg has remained numb. Our garden finally rebounded from too much rain, after Ed made a huge ditch at the end of it and drained the water away from it. Then the drought set in! We haven’t had any substantial rainfall in over a month! The crawl space of our house remains moist, in spite of having a moisture barrier, having two fans installed, and experiencing a month-long drought! Ed is currently working on replacing the underpinning of the house, and adding more ventilation. 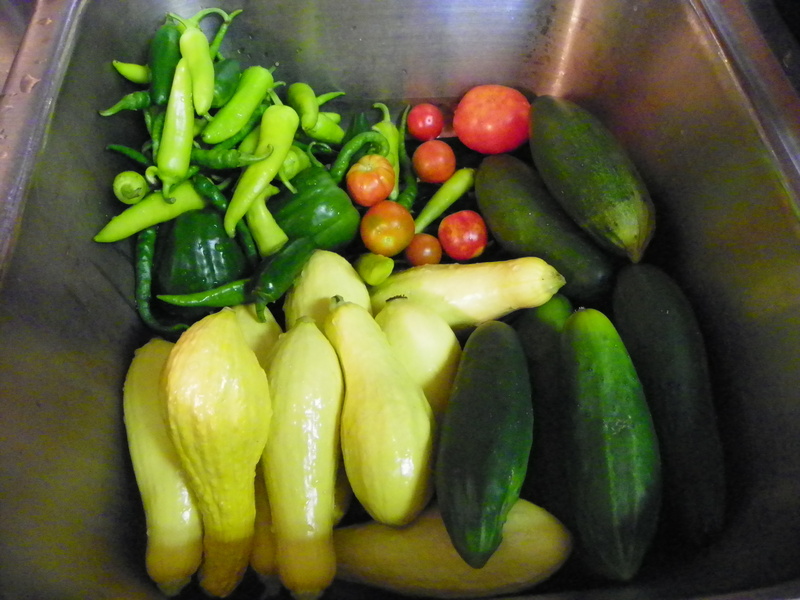 In spite of nearly drowning, followed by a severe lack of water, our garden has produced many vegetables. Thank goodness for water sprinklers! Harvesting most of those vegetables has fallen squarely on Ed’s shoulders, due to my back problems. I have been able to help freeze and ‘can’ some of the things Ed has picked though. I’m very tired of seeing cucumbers, squash, peppers, and green beans, but I’m thankful for all we’ve been blessed with. Ed and I didn’t realize it, at the time, but our daughter and her husband, who live next-door to us, were experiencing marital difficulties during the month of April. During the first week of May, the two of them separated. They were apart for a few days, then came back together, shortly after Mother’s Day, to try to work things out. On Memorial Day, our son-in-law packed up and left again. At the moment, things are up in the air with them. The week after Memorial Day, I made the mistake of going out into the garden. I only sat on the garden stool for about ten minutes, but, apparently, that was long enough to aggravate my sciatic nerve, and I began having spasms again. Tomorrow will make eight long weeks that I’ve been dealing with this problem. Out of desperation, I called the doctor’s office, yesterday. He was booked solid, but agreed to see me at the end of the day. After hearing my symptoms and examining me, he agreed that it sounds like I probably have a pinched nerve. He prescribed a round of Prednisone, and ordered x-rays to see what’s going on–x-rays that my insurance isn’t going to pay for. Expensive x-rays. Sigh. I’ll be having my MRI today. I guess we can just add the bill for the x-rays to the $900 worth of lab work we still owe for–the lab work the doctor’s office sent to the wrong lab… And so our saga continues. There is some good news on the horizon though. It looks like our youngest son and his family will be moving back ‘home’ in about a month, or sooner. They’re currently in the process of selling their house, and the closing is scheduled for July 1. Brad and Jennifer have both gotten new jobs, as well, and they will both be starting those on June 8. While Brad and family won’t be moving back to the family farm, they will only be living ten minutes away from us. For now, they’ll be staying with Jennifer’s dad and her step-mother. We’re ‘tickled pink’ about the prospect of having them so close. It’s sort of like seeing a rainbow after a storm. On Friday, Ed and I went on a bit of a shopping outing. My back is far from being normal, so my outings are still brief. Ed drives me to the front door of the store, I quickly shop for what I need, then go back to the car to rest my back. For now, two stores is my limit. The muscle spasms are subsiding, and I’m able to stay on my feet for longer periods of time, but I’m far from normal. Recovering from this reminds me of recovering from surgery! It’s slow going. In other news, our weekend weather was unseasonably cool. Nights and early mornings required a light jacket of some kind. This is very unusual for this time of the year. We’re still trying to dry out from the six inches of rain we received last week, too. Of course, the cool, wet weather makes perfect conditions for grass to grow, and our lawn has never looked better! The garden? No so good. Some plants took a hard hit from too much water, and the grass and weeds are running rampant. It’s still early, and it can recover–if we don’t get another flood! I think our old desk top computer may be on its last legs. It has Windows Vista so that tells you how old it is. Ed and I are in the process of backing up all of my pictures and music. I’ve already saved the data on an external hard drive, but wanted to put it on jump drives, as well. We used two 64 GB jump drives for pictures, alone! I used to take lots of pictures, these days, not so much–which explains the lack of pictures on my blog. I did, however, find some great older pictures that I’ll share here on the blog, sometime in the future.